Telling reporters that he brought in famed organizing consultant Marie Kondo to help consolidate and clean up the Vatican, Pope Francis Thursday said that he was now feeling “much better” after decluttering the city-state of all but five of bishops. At press time, Francis has confirmed that he is retiring, effective immediately. Go here to comment. 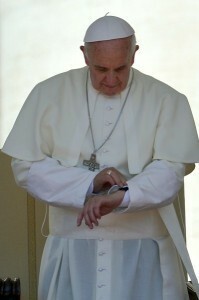 And then PopeWatch woke up. Who is going to de-clutter Pope Francis’ mind?